Aim. The influence of junction elasticity of unbalance vibration exciter with asynchronous electric drive rotor on oscillating processes in drive of the vibration machine for improving its dynamic characteristics is investigated. Method. Methods of applied theory of oscillations, the approach of vibration mechanics and method of direct division of movements were used for analytical investigations. Simulation of the vibration machine start process was based on the numerical integration of differential equations of motion of a mechanical vibrational system and a dynamical model of an asynchronous electric motor using the Maple software product. Results. In scientific work it was shown that the presence of an elastic junction brings essential features in the vibration machine dynamics and that should be taken into account in their constructional design. Formulas that allow estimating the amplitude of starting strains and the magnitude of the moment that occurs in the drive are obtained. It is shown that amplitude of oscillation of the drive at the moment of start of the vibration machine mainly depends on the distance of its own frequency from the frequency of the current in the power supply of the electric drive. It was obtained the equation of torsional oscillations of the drive near stationary rotational modes of unbalanced drive (which, incl., takes into account the case of "jamming" of the speed of the electric drive in the zone of resonant frequencies of the vibration machine). Existing interconnection of oscillations of the carrier system of the vibrating machine and the drive is revealed. It is stated that during the start of vibration machines when the effect of Sommerfeld occurs, except for the resonant growth of the brake vibration moment and "jamming" of the speed of the electric drive, resonant oscillations of elastic damping elements (connecting the rotors of the engine and the exciter which increase the dynamic load and energy losses in the system) excite. Scientific novelty. The theoretical positions of the start-up dynamics of vibration machine with inertia drive, taking into account the elasticity of the junction of the rotors of the electric drive of limited power and unbalanced vibration exciter were further developed. It is stated that in case of presence of elastic element in drive of vibration machine, to its critical frequencies, the frequencies of the vibration machine’s own oscillations and current frequency in the power supply of the electric drive are added. Practical significance. The results of the scientific work allow choosing the parameters of vibrating machines with an unbalanced drive more reasonably which will reduce the amplitudes of its oscillations and dynamic loads. I.I. Blekhman. Teoriya vibratsionnykh protsessov i ustroystv. Vibratsionnaya mekhanika i vibratsionnaya tekhnika [The theory of vibrational processes and devices. Vibration mechanics and vibrating technology]. – Saint Petersburg, Russia «Ruda i Metally», 2013. – 640 p., [in Russian]. I.I. Blekhman Vibratsionnaya mekhanika i vibratsionnaya reologiya (teoriya i prilozheniya) [Vibration mechanics and vibrational rheology (theory and applications)]. – Мoscow, Russia: Fizmatlit, 2018. – 752 p., [in Russian]. O.S. Lanets Vysokoefektyvni vibratsiyni mashyny z elektromahnitnym pryvodom (Teoretychni osnovy ta praktyka stvorenyya) [High-efficiency vibration machines with an electromagnet drive (Theoretical foundations and practice)]. Publishing house NU «Lvivska politekhnika» Lviv. 2008. – 324 p., [in Ukrainian]. O.S. Lanets Osnovy rozrakhunku ta konstruyuvannya obliku mashyn (Knyha 1. Teoriya ta praktyka stvorennya vibratsiynykh mashyn z harmoniynym rukhom robochoho orhanu) [Basics of calculation and constructing of machine accounting (Book 1. The theory and practice of creating of vibration machines with harmonious motion of the working body)]: Tutorial. – Lviv: Publishing House of the National University «Lvivska politekhnika». 2008. – 600 p, [in Ukrainian]. І. І. Nazarenko Doslidzhennya nadiynosti kardannykh valiv vibromashyn budivelʹnoyi industriyi [Reliability investigation of cardan shafts of vibratory machines in the building industry] / І. І. Nazarenko, А. Т. Sviderskyi, М. М. Delembovskyi // The vibrations in engineering and technology. – Vinnytsia. – 2013. – №3 (71). – 72–77pp., [in Ukrainian]. M.P. Yaroshevich, T.S. Yaroshevich. 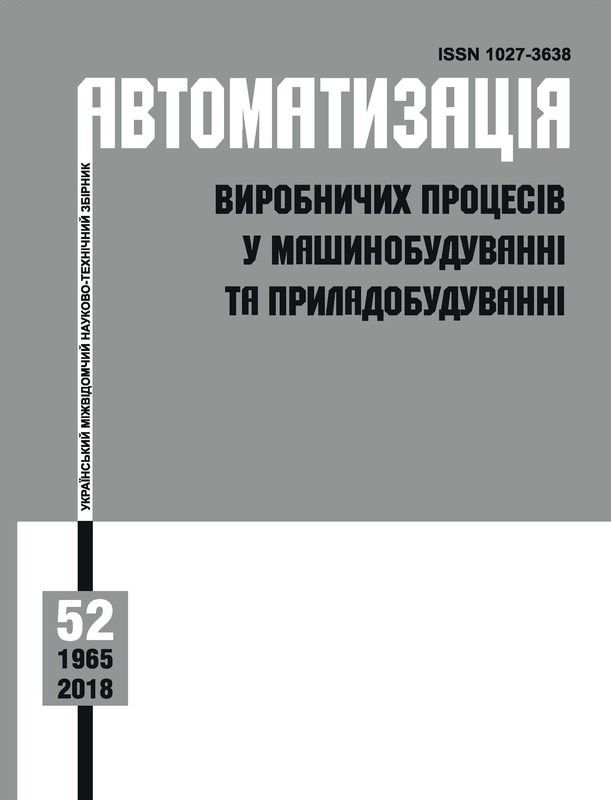 Dynamika rozbihu vibratsiynykh mashyn z debalansnym pryvodom [Start dynamics of vibration machines with unbalanced drive]: Monography / Lutsk: LNTU, 2010. – 220 p., [in Ukrainian]. N.P. Yaroshevich. Dynamika rozbihu vibratsiinyh mashyn z debalansnym pryvodom u vypadku ploskyh koluvan robochoho tila [Dynamics of vibrating machines starting with unbalanced drive in case of bearing body flat vibrations] / M.P. Yaroshevich, I.P. Zabrodets, T.S. Yaroshevich // Scientific periodical of NGU. Dnipropetrovsk. – 2015. – № 3. – 39–45 pp., [in Ukrainian]. I.V. Kuzio. Syntez nyzkochastotnykh rezonansnykh vibratsiynykh mashyn z aeroinertsiynym zburennyam [Synthesis of low-frequency resonant vibration machines with air inertia perturbation] / I.V. Kuzio, O.S. Lanets, V. Hurskii // Scientific periodical of NGU. – 2013. – №2. – 37-45 pp., [in Ukrainian]. O.S. Lanets, V.M. Hurskii, O.V. Lanets, Y.V. Shpak Obgruntuvannya konstruktsiyi ta modelyuvannya roboty rezonansnoho dvomasovoho vibrostola z inertsiynym pryvodom [Justification of the design and simulation of the operation of a resonant two-mass vibration table with an inertia drive] // Dynamics, durability and design of machines and devices: Periodical of NU «Lvivska politekhnika», — Львів, 2014. — № 788. —28–37 pp., [in Ukrainian]. G.B. Filimonikhin Issledovaniye protsessa vozbuzhdeniya dvukhchastotnykh vibratsiy sharovym avtobalansirom grokhota [Investigation of the process of excitation of two-frequency vibrations by ball auto-balancer Gil 42] [Text] / G.B. Filimonikhin, V.V. Yatsun // East European Advanced Technology Journal. – 2016. – № 1/7(79). – 17–23 pp., [in Ukrainian]. G.B. Filimonikhin Research into excitation of dual frequency vibrational-rotational vibrations of screen duct by ball-type auto-balancer [Text] / G.B. Filimonikhin, V.V. Yatsun, K. Dumenko // Eastern-European Advanced Technology Journal. – 2016. – Vol. 3, Issue 7 (81). – 47–52 pp. Blekhman, I. I., Indeitsev, D.A., Fradkov, A.L. Medlennyye dvizheniya v sistemakh s inertsionnym vozbuzhdeniyem kolebaniy [Slow motions in systems with inertial excitation of vibrations]. Journal of Machinery Manufacture and Reliability, 1(38), 21–27. J. M. Balthazar, D. T. Mook, H. I.Weber, Brasil, R. M. L. R. F., A.N. Fenili, D.N. Belato, An overview on non-ideal vibrations. – 2003. – 38(6), 613–621 pp. Y.V. Mikhlin. Rezonansnyye kolebaniya v sisteme s ogranichennym vozbuzhdeniyem [Resonant oscillations in a system with limited excitation]/ Y.V. Mikhlin, A.A. Klimenko, E.U. Plaksii // Periodical of Zaporizhzhya National University "Mathematical modeling and applied mechanics." – 2015. – № 2. – 135–141 pp., [in Ukrainian]. Dinamika mashin i upravleniye mashinami [Dynamics of machines and machine control]: handbook/ V.K. Atashev, V.I. Babitskyi, I.I. and other; edited by G.V. Kreynin. –Мoscow. C, 1998.-240 с.
M.Z. Kozlovskyi. Dynamika machyn [Machine dynamics]. Leningrad. Machinery building. 1989.– 263 p., [in Russian]. I.I. Blikhman, A.L. Fradkov Upravleniye mekhatronnymi vibratsionnymi ustanovkami [Control of mechatronic vibration systems] / Saint Petersburg..: Nauka, 2001, 278 p, [in Russian]. O.P. Tomchyna Energoskorostnyye algoritmy sinkhronizatsii dlya mnogorotornykh ustanovok s uprugimi kardannymi valami [Power-speed synchronization algorithms for multi-rotor installations with elastic cardan shafts] / O.P. Tomchyna, V.V. Reznychenko, D.V. Gorlatov // Computer science and control systems. – 2014. – №4 (42). – 101–112 pp., [in Russian]. Шатохин В.М. Analiz i parametricheskiy sintez nelineynykh silovykh peredach mashin [Analysis and parametric synthesis of nonlinear power transmission machines]: Monography / Harkiv: NTU «HPI», 2008. – 456, [in Ukrainian]. A.P. Babychev, I.A. Babychev Osnovy vibratsionnoy tekhnologii [Basics of Vibration Technology]. – Rostov na Donu: DHTU, 2008. – 694 p., [in Russian]. I.I. Blekhman K dinamike privoda vibratsionnykh mashin s inertsionnym vozbuzhdeniyem [To the drive dynamics of vibration machines with inertial excitation] / I.I. Blekhman, L.I. Blekhman, N.P. Yaroshevich // Obogashcheniye rud. 2017. 3. 49–53 pp., [in Russian]. V. Chaban Matematychna model vuzla zhyvlennya asynkhronnykh mashyn [Mathematical model of the institute live asynchronous machines]. Lutsk: LNTU, 2013. –116 p., [in Ukrainian].